← Poetry slams? Where have I been? I’m about to be part of a deliberative body this Sunday. My local Lutheran congregation will meet to discuss a highly contentious issue, which I’d prefer not to air at the moment. Odds are good that I’ll be in the minority on this issue, so I’ve been taking extra time to study Robert’s Rules of Order. I’ve dealt with Robert’s Rules on and off since I was 13 and served as the president of my freshman class. Most of us pay them little mind and rely on others to understand their ins and outs. Usually, unless there’s a trained parliamentarian in the room, people feel their way through them as best they can. That works sufficiently well unless issues are controversial and emotions run high, and that’s where I expect things to be on Sunday. I’m concerned that discussion could be cut off prematurely, and if that happens, I believe the membership will be cheated in the process. As a precaution, I’m learning about tactics to try to prevent that from happening. In the course of my studies, I’ve found out that the creator of Robert’s Rules, Henry Martyn Robert, was strongly focused on protecting the rights of the minority. The foreword to the latest edition explains that, when deliberative bodies grow much larger than 15 people or so, “A certain paradox appears. In order to preserve its freedom to act, the body must impose regulations. “The needed control must not only ‘keep order.’ It must of course be geared to getting the business done and resolving any issues that may arise along the way. But – even more important – it must do these things in a way that’s fair to everyone taking part in the process.” I’m hoping that the chair of my meeting will understand and abide by this basic principle. 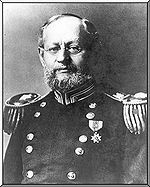 Robert, a brigadier general and military engineer in the U.S. Army, served in the Civil War and was appointed as the Army’s chief of engineers in the early 1900s. He wrote his first version of rules in 1876 after his poor performance in leading a meeting at a Baptist church in New Bedford, Massachusetts. Here’s hoping that his dedication to order and fairness will be manifested on Sunday. This entry was posted in Leadership, Politics, Religion and tagged fairness, protection of minority rights, Robert's Rules of Order. Bookmark the permalink. Fascinating, Pete. I hope you plan to write an epilogue to Sunday’s proceedings. I’m guessing the issue at hand isn’t related to children’s nutrition and toys. Fascinating Pete. I remember back in college fraternity days being handed this book about Robert’s Rules. Never understood it or figured it would ever come into play in real life. Now, virtually every organization uses them. And I [like you mention] do my best to feel my way through them. Perhaps we should be introduced to them earlier so we are more comfortable with them.